We do not ship printed copies. Thank you for your support! From a structural perspective, there's nothing more important in the design of a new home or remodel than the foundation and its associated perimeter drainage. Without a solid foundation and proper drainage, it's only a matter of time before you'll realize the high cost of poor design. Settlement, sloping floors, sticking doors, cracked stucco, and sheetrock splitting at the seams are all signs that the foundation may be shifting right under your feet. A foundation must withstand heavy downward forces imposed by the weight of the structure above. It must also withstand strong upward pressure from moist swelling soils, plus the lateral forces imposed by hillsides, heavy winds, and earthquakes. In addition, proper perimeter drainage from eaves and groundwater not only helps to ensure foundation stability, but it can prevent excessive moisture and stagnant water from pooling under the foundation. If left ignored, this will lead to rot and unhealthy levels of indoor humidity. Often overlooked, unfortunately, are the crippling effects that certain soil types inflict over the years. In much of California and across the Western states, heavy clay content is common in many areas. When exposed to moisture, clay expands like a sponge, creating huge upward forces strong enough to crack a conventional foundation in half. Soil expansiveness of 3-5% is not uncommon, yet even slight expansion manifests itself in the form of cracked stucco, plaster, sheetrock, driveways, sticking doors, and sinking floors. When clay dries in the summer months, it shrinks noticeably, creating cracks and valleys in the soil that wreak havoc with conventional foundation systems. Over time, this periodic heaving of the ground takes its toll on structures, causing premature deterioration, structural weakness, and a host of other chronic problems. In the San Francisco Bay Area where we live, expansive clays are ubiquitous and have been observed by soils and structural engineers to cause hundreds of millions of dollars in damage to residential structures. While many people elect not to remedy the condition (because of high repair costs), the damage persists, ultimately deteriorating the structure’s integrity and livability. This causes the home to lose value while its owners lose peace of mind. One coworker of mine solves his sticking-door problem by watering the base of his foundation overnight. By the next day, the soil swells enough to re-level the plate under the door, allowing the door to swing without binding. This simple experiment shows how soil type and moisture content can induce differential settlements as great as 1/2" or more. Fortunately, with modern knowledge of geo-technical, structural, and civil engineering principles, you can build a home with confidence that foundation settlement will remain negligible over the course of time. This is of particular concern in areas that are being developed on hillsides, landfill or highly expansive clays that have proven to be problematic. Depending on your soil and geological conditions, most residential structures rely on one of several types of foundation systems: 1) slab on grade, 2) raised foundation with spread footing, or 3) pier and grade beam. In colder climates where foundations extend well below the freeze line, a fourth type of foundation typically goes deep enough to allow for basements. This is why basements are so common in the colder northern and eastern climates of the US, but less common in west. Such foundations are more like deep retaining walls built with steel reinforced concrete, cement block, or insulating concrete forms (see chapter on ICFs). If your home was built long ago, there's a chance that your foundation has limited steel reinforcement compared to modern standards. What steel there is may be rusted. Deformed steel rods (rebar) imbedded horizontally at the top and bottom of the concrete footing and stem wall add tensile strength to the concrete to resist effects of weight loading and soil upheaval. If you plan to build a new home, investigate your soil conditions prior to designing and building your dream. Even if local authorities don't require a soils inspection, a few hours of research and phone calls can help you determine if your general area is noted for unusual or adverse soil conditions. Find out what type of foundation systems your neighbors have and which ones have experienced noticeable foundation problems. Look for symptoms of settlement. Can you find any clues that point to a shifting foundation? In addition, some parts of the country are known to have radioactive gases, such as Radon. In these situations, a simple test can reveal whether special precautions must be taken during construction to prevent excessive build-up of potentially harmful Radon gas. If you’re uncertain, retain the services of a reputable geo-technical firm. Their records may indicate problems in your area and provide a good clue as to conditions on your site. Unfortunately, relying on this data alone is not sufficient to guarantee that your precise location has the same geological makeup as neighboring property. During development of new residential areas, hundreds of cubic yards of earth could have been moved around or re-deposited on your site during grading and excavation. Only sample drilling and laboratory testing will reveal the actual makeup of your soil conditions and provide the soils engineers with information that will lead to the most cost effective and proper foundation system for your project. In general, if you’re remodeling, it’s advisable to use the same basic type of foundation systems as what you have, unless your current foundation is clearly problematic. Mixing foundation types could result in differential settlements, causing the old and the new to separate at the seams. This is a complex matter and should be left to your architect, structural and geo-technical engineers to resolve. If the condition of your existing foundation is poor, you might consider the wisdom of significant additional investment, unless your foundation can be repaired or reinforced to modern standards. Fortunately, with careful planning and execution, a specialized contractor can elevate a home from its old foundation, while a new and improved one is put in its place. Such a process is neither simple nor inexpensive, although it less expensive than building a new home from the ground up. Before doing this, consider all of the expenses you’ll incur to bring the house up to modern standards. Above all, if the home is older, there's a good chance the floor plan is not as functional compared to modern requirements for spacious kitchens, baths, and master bedroom suites. Ultimately you must weigh the cost-benefit tradeoffs. Due to their economy and relative ease of construction, slab-on-grade foundations are popular, particularly in moderate climate areas where frost penetration and super insulation are unimportant. Many homes in mild-climate areas (such as Southern California) are built on slab foundations, whereas most homes in areas with cool to cold winters have basements or raised foundations with a crawlspace underneath. Slabs have one advantage in that they are not as subject to termite damage, at least in the floor area where there are no floor joists suspended over damp areas. The combination of a properly laid vapor barrier, good ground compaction, steel reinforcement and uniform thickness of concrete can be an effective shield against subterranean termite penetration in some cases. By no means, however, are homes with slab foundations immune from termite infestations. On the contrary, with the proximity of the walls to the ground, subterranean termites can enter unnoticed through hairline foundation fractures or sidewall sheathing. Flying termites also known as dry-wood termites often enter through the eave ventilation ports and can infest a home in walls, ceilings, attics and garages. If your architect recommends a slab-on-grade for your home, there are several other aspects to consider. First, as with any concrete work, proper ground preparation is essential. Achieving the recommended compaction level, moisture conditioning, and placement of reinforcing steel is of paramount importance. Improperly compacted soil will result in foundation sagging, causing stress fractures at weak points. Poor moisture conditioning will result in uneven curing, resulting also in tension cracks. As for reinforcement, it's popular to use welded wire mesh. However, if not carefully installed, wire mesh generally gets crushed against the bottom of the concrete as the weight of the wet cement pours on and workers trample through. Core samples from numerous slabs clearly show that wire mesh provides little or any of the expected reinforcement desired unless extra precaution has been taken during site prep to buoy the wire mesh with frequent supports such a cement dobies or formed wire supports called chairs. Even then, this may not be sufficient. For slabs exposed to high loads, wide temperature swings, or expansive soils, an improved alternative is to suspend a grid of #4 or heavier rebar spaced typically from 12" to 16" on center. Closer spacing may be required under certain loading conditions. 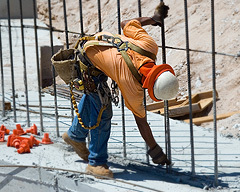 In some applications, such as heavy-duty structural slabs, there may even be a double layer of rebar (one grid on the bottom, another on the top). This helps to improve the tensile strength of the slab due to both downward and upward pressures. Again, frequent support of the steel is essential if the rebar is to remain imbedded at the proper depth specified on the plans. In addition, to help prevent hairline cracks which can lead to future moisture penetration and premature failure, the addition of 1.5 lb. per cubic yard of polypropylene fiber strands to the concrete mixture, such as Fibermesh ( www.fibermesh.com ), greatly increases the secondary tensile strength of the concrete. Fibermesh is also excellent for other slab on grade applications, such as sidewalks, driveways, decorative walkways, patios, curbs, as well as retaining walls, foundations, stucco, and pre-cast architectural facades. Made of 100 percent virgin homopolymer polypropylene, Fibermesh is a suitable replacement for welded wire mesh and is less labor intensive. It is not a substitute for proper temperature and tensile reinforcement in concrete such as rebar, but it can be used in conjunction with rebar to provide superior secondary crack control. Mixed in to the cement prior to pour, millions of random oriented strands help to hold the cement together during the curing phase, vastly reducing or eliminating shrinkage stress fractures. In addition, Fibermesh provides other advantages, including improved impact, abrasion, and shattering resistance and reduced plastic shrinkage and settlement. A side benefit is improved resistance to water migration since there are fewer cracks for which water can migrate. Since Fibermesh is rustproof, alkali proof, and requires no minimum amount of concrete to cover, it is a strongly recommended additive to most applications where superior localized tensile strength and crack-free performance or appearance is important. Minimum required concrete cover 0" 1"
All slabs in living areas or interior areas must contain a suitable vapor barrier. For heavy-duty protection, use a 12-mil thick polyethylene sheeting overlapped at least 6" at all seams and taped to prevent slippage and paths for moisture migration. Sometimes a 2" thick base of fine sand is placed over the vapor barrier to protect it during placement of the concrete. If the sub-base contains jagged rocks, a layer of protective sand can also be placed on the sub-grade before laying the vapor barrier. Proper foundation drainage is always important, even in dry climates where domestic irrigation can seep under the slab, causing potential moisture problems. In the case of slabs, perforated drain pipe may even be placed under the slab and around the perimeter to collect moisture and draw it away from the house, to a sump or other suitable discharge. In many parts of the country, such as in Northern California, raised foundations are preferred. More expensive than slabs, but less expensive than foundations with full basements, a raised foundation keeps the house off the moist ground and allows service access to pipes and heating ducts. Although building codes require only 18" between the sub-house grade and the bottom of floor joists, you are urged to leave at least 32" or more clear. This allows plenty of room to run heating ducts, plumbing, electrical, and other mechanical attributes, while maintaining enough clearance to crawl your way underneath the maze of sheet metal and pipes. It also allows ample opportunity to properly grade the lot, which encourages proper drainage away from the foundation towards the street. For homes with crawlspaces, a procedure called "rat proofing" is a good idea that not only keeps moisture down, but makes a clean and dry surface you'll appreciate next time you crawl under your house for repairs. Rat proofing is a 3"-thick layer of concrete on the under-house sub-grade. This not only minimizes potentially damaging moisture from penetrating the sub-floor, but it provides a clean, level surface under the house that makes periodic service visits much more palatable. There's nothing worse than slithering on your back through mud in a tight crawlspace. In the case of rat proofing, steel reinforcement is generally unnecessary because there is no direct load placed on the cement. If, however, the soil is highly expansive, the use of reinforcing wire mesh or better, Fibermesh additive will help keep the concrete from developing fractures and breaking apart. In fact, it will help keep the cement from breaking apart into loose pieces should soil swelling occur during rainy months. If you plan to rat-proof, be sure to take its added thickness into account when planning the foundation design. The combination of sand base and concrete can take anywhere from four to six inches out of your crawlspace clearance unless you plan accordingly. In areas subjected to ground freeze and thaw cycles, the depth of the perimeter and interior footings must go below the frost line to avoid ground heaving during freezing periods. This may be several feet, which is why basements are common in colder-climate areas such as in the East and Midwest. In moderate climates, typical footings go 18" to 30" into the ground and extend at least six to twelve inches above ground. In some areas, the use of reinforced concrete blocks is common, particularly where basements may be included. This method of construction can be more economical because no formwork is required for huge retaining walls. However, the porosity of cement blocks and grouting require particular attention to waterproofing if moisture penetration is to be avoided. Sealing the exterior with a bond coat of Anti-Hydro or bituminous asphalt is essential. This practice should be followed even with cast-in-place concrete, although moisture proofing additives can be added to the concrete itself prior to pouring. Because additives affect the concrete slump (viscosity) and accelerate curing time and early strength, consult with your contractor and the manufacturer of the additives to ensure proper water/cement ratios are used. Many local ready-mix companies provide the additives at a nominal cost. One common problem with raised foundations, particularly on many older homes, is settlement of interior floors and partitions. Most traditional raised foundations rely on a network of floor joists supported on intermediate girders. These girders are generally supported on 4x4 posts resting on shallow concrete bases, perhaps only one or two feet deep. As the ground swells and retreats throughout the course of the seasons, the piers literally push the interior of the house up and down, causing cosmetic and structural failures in addition to uneven floors. Over time, these stresses cause related problems such as leaking roofs, sticking doors, and even broken pipes. The situation can become so acute that some posts even separate from the girders providing little if any support at key places. This leads to warped girders, and sinking floors, making it difficult to ever re-level the house properly. It's not uncommon to examine homes and spot several shims between posts and girders that have been inserted over time to keep the house leveled. This technique is like capping a geyser with a bottle cap. Whether you plan to remodel or build from scratch, avoid any intermediate, free floating piers wherever possible. Where you need interior supports for bearing walls, use a continuous footing, just like the one on the perimeter of your house. By using a continuous concrete footing you greatly improve the structural integrity of your foundation and ensure that differential settlement will be kept to a bare minimum. Should your house rise or settle with changes in your soil moisture content, the whole structure will tend to move as a unit. Of course, by breaking up your crawlspace into several compartments, you must account for plenty of access holes and connecting passageways. Try to place tunnels in such a way to ensure good lighting and cross ventilation. Don't forget to leave holes for plumbing supply and waste lines, gas lines, and heating ducts. If such a maze of compartments is impractical, at the very least, intermediate supports should be drilled deep into the ground to provide plenty of skin friction to resist ground heaving and settling. Keep in mind that the use of girders further limits your crawlspace clearance. The building code requires at least 12" clear from the sub-grade to the bottom of the girder (18" to the bottom of joists) unless you use pressure-treated lumber. Any less and you won't ever be able to have clear access under the house for repairs and maintenance. The preferred foundation system for landfill, hillside, and expansive soils is the pier and grade beam foundation. Much like elevated highways and bridges rely on giant steel-reinforced piers (sometimes called caissons) to support the massive weight of the road above, a pier and grade beam foundation relies on improved soil-bearing capability well below the surface of the ground to bear the weight of the house above. When viewed from the outside, a pier and grade beam foundation looks no different that a conventional raised foundation. The piers are hidden deep underground, yet their role in supporting the structure is essential. Pier depths and diameters vary depending on the pier span, concentrated loads, and soil type. Typical residential pier designs range from 12" to 18" in diameter and from six to twenty feet deep. Pier spacing depends on the required load transfer, but typical spacing ranges from five to eight feet on center. Areas built on landfill where seismic forces tend to amplify ground motion may have piers that go much deeper. In most cases, piers rely on the skin friction of the concrete pier walls against the rough sides of the pier cavity to support the structure. By contrast, end-bearing piers rely on the stability of the surface below to provide a competent bearing capability, such as bedrock. With modern drilling rigs, pier and grade beam foundations can be relatively price competitive compared to deep continuous footings. However, the contractor must exercise extreme care when building such a foundation to ensure proper alignment of the piers and integrity of joints between the piers and the grade beams. To adequately support a two-story structure with the added weight of tile floors and a tile roof, our foundation required 62 12"-diameter piers roughly 11 feet deep and six feet on center. Some piers subjected to heavy concentrated loads (such as those from large supporting beams) went as deep as 15 or 18 feet to ensure adequate skin friction support. To ensure structural integrity and minimize damage caused from potential lateral forces (primarily seismic in our case), each concrete pier was reinforced with four #5 rebars (steel) running the vertical length of each pier cavity. The tops of each rebar cage were bent at right angles forming steel "T's" that would later anchor into the horizontal grade beams. These massive steel cages look rather impressive stacked up on the side of the lot awaiting their insertion into each pier cavity. With roughly 50 cubic yards of concrete and 400 lineal feet of 8" x 36" grade beams, bids for this foundation ranged as high as $30,000. Reinforcing steel alone accounted for over $4,500, while drilling took less than one day costing roughly $3,000. The formwork consisting mostly of horizontal two-by-twelves made an imposing structure in its own right. Had our building site been located on a steep hillside with a lot of bedrock, drilling costs would have been dramatically higher, perhaps doubling or tripling the cost of the foundation. Should you elect to build your home with a pier and grade-beam foundation, consult with your architect or structural engineer to develop a design that is both cost effective yet practical to build. Some structural engineers and architects aren't in touch with the realities of field practices and potential workmanship problems that can easily plague even the most carefully supervised construction projects. As a result, many "engineered" structures have been overly optimized for each aspect, when in practice it might be less confusing in the long run to keep certain design details as consistent and uniform as possible. This philosophy extends beyond foundation design and can be carried throughout the entire project. Clearly this requires careful judgment. A competent engineer or architect with practical field experience will relate to this point and help you determine the right tradeoffs. Therefore, minimize the number of exceptions in your design whenever possible. For example, your structural engineer might determine that certain piers should be 10 feet deep, while others should be 12-feet deep. At first glance, the two different depths will save money on concrete, rebar, and drilling. However, in practice, the material savings may be more than offset by confusion in the field resulting from different pier depths. With two different pier types, someone has to worry about differentiating between holes, ordering rebar cages of different lengths, making sure which ones go where, and taking the very real chance that someone will make a mistake in the field. Situations like this occur all the time. You order two types of tile, you can be sure someone will mix them up and put the kitchen tile in the bathroom and the bathroom tile in the kitchen. It happens with wallpaper, with windows, with carpeting, with plumbing fixtures, and with just about everything there is. Anything that can go wrong has a good chance of going wrong. In this sense, many contractors underestimate the high cost of design exceptions. Lack of consistency in a design gives rise to things that can get switched accidentally. Similarly, contractors should bid more aggressively on projects with few design exceptions because there is great savings when confusion and rework are minimized or eliminated altogether. Except for those who live in seismically active areas, most people spend little time worrying about earthquakes. This situation is especially troublesome because virtually no part of the North America is entirely immune from potentially damaging quakes. While it’s true that the Western territories bordering the Pacific experience more frequent intervals of seismic activity, geological and historical records show that many regions throughout North America are capable of producing earthquakes of magnitude 6 or greater. One region due for such a quake is the New Madrid Fault in the Midwest. The last quake struck in Missouri during 1811, with a an estimated force of 7.5 on the Richter scale. Were a quake of this magnitude to strike near a major city, such as St. Louis, the results could be catastrophic -- especially in light of the large numbers of old masonry buildings and general lack of seismic design codes. Since this region experiences large quakes only every one to three hundred years, it's understandable how the low apparent risk has precluded more rigorous building standards from emerging. The resulting damage from a large quake when it occurs will likely result in mass destruction, causing billions in damage and killing thousands of people. Each earthquake offers engineers a wealth of real-life data that ultimately lead to stricter building codes and safer structures. Careful analysis of failed and intact structures helps seismologists and structural engineers to develop improved models and a deeper understanding of the potential failure mechanisms in existing structures. It's easy to see the damage in areas that are supposedly prepared for earthquakes -- such as in Los Angeles during the Northridge quake, or in Kobe, Japan where fatalities surpassed 5,000 and damage to structures exceeded $100 billion. Imagine the cost if an earthquake were to strike in an area of the country unprepared for such occurrences. Furthermore, the Kobe quake is a good example of what can happen when a quake strikes a metropolitan area unprepared for such an occurrence. I was in the Osaka-Kobe area a few months prior to the quake and have business friends whose homes were subsequently damaged or destroyed. I noted then that many of the homes seemed poorly constructed -- with minimal foundations, skimpy exteriors will little shear-wall reinforcement, and heavy ceramic tile roofs. Coupled with the impressive density and narrow streets, it's no surprise that thousands perished under the weight of collapsed structures. The tragedy serves as a wake up call. With the 1923 Tokyo quake in which 143,000 people died, earthquake preparedness focused on Japan's largest city which was most seismically active. Kobe, in the southwestern part of Japan was not considered a high-risk area despite a number of smaller faults in the area. So when the quake struck, the years of earthquake planning for the Tokyo area meant little to the over 300,000 homeless in Kobe who rebuilt their lives from the ground up. With all the attention to Los Angeles and San Francisco awaiting the "big one," other less prepared parts of the country could be in for a big surprise -- and mass destruction. While it's true that no amount of engineering can completely render a structure "earthquake proof," a number of relatively cost-effective practices can help greatly increase the odds of surviving such an occurrence. The damaging 1989 Loma Prieta Earthquake in Northern California is still in recent memory, and the relative performance of different foundation systems has stimulated renewed interest by structural engineers. Homes built without proper foundations on landfill or silty soils suffered significant foundation failure. Pier and grade beam systems, on the other hand, fared well even in areas where ground shaking and liquefaction were substantial. Despite some well designed foundations, some homes still collapsed because of improper framing techniques, such as unsheathed cripple walls or a lack of framing anchors and hold-downs. One coworker of mine lost his $350,000 home in the Santa Cruz Mountains because of one unsheathed cripple wall. The house caved inward as the short studs toppled like wooden dominos. Had he been aware of this framing deficiency, he could have braced the wall with plywood sheathing for less than $250 in labor and materials. Sadly, the house was nearly a total loss. My friend who had no earthquake insurance had little choice but to walk away from his quarter-million dollar loan and settle with his bank for twenty cents on the dollar. These lessons illustrate the importance of careful geo-technical and structural engineering. Regardless of the foundation type, it's important to anchor all bearing walls securely to the mud sill and foundation. While the Uniform Building Code specifies a minimum of one 1/2" anchor bolt every six feet, in earthquake country use 5/8" minimum diameter bolts on 32" centers at a minimum. Bolts are cheap compared to the expense of repairing a house that falls off its foundation. At one time, anchor bolts were considered sufficient to prevent a house from toppling over during an earthquake. Structural damage to wood-framed houses over the past several decades has shown a clear need for additional seismic bracing. Anchor bolts do a fine job of holding the mud sill onto the foundation but don't prevent the walls from jumping off the sub-floor during periods of strong seismic upheaval. Seismic hold-downs transfer lateral and vertical forces to the foundation, uniting the walls and footings into one structural element. Typical engineered residential structures have anywhere from 10 to 50 hold-downs or more. Simpson, USP Connectors are just a few of several companies that manufacture steel ties and hold-downs. Newer designs such as Simpson's HDA series offer one-piece construction making them significantly stronger than older welded designs. An HD5A manufactured from 10 gauge steel withstands up to 20,000 lb. of uplift when used in accordance with specified design rules. Such loads seem massive, yet a strong earthquake imposes huge forces to structures. Long ago Newton discovered that force equals mass times acceleration. Knowing, then, the weight of a structure and the ground acceleration produced at the site, it's easy to estimate how much force a given structure is likely to experience. Our home is located just 3-1/2 miles east of the famous San Andreas Fault that runs up the California coastal range into the Pacific. The geo-technical report indicated that an 8-magnitude quake in the vicinity of our home would produce effective site acceleration of 0.25g or greater. Unstable soils common in some parts of the Bay Area could significantly amplify the peak acceleration, imposing yet stronger forces on a given structure. Nature confirmed this hypothesis when homes in the Marina district of San Francisco experienced severe damage from liquefaction of bay mud consisting mostly of silt and sand. Despite warnings from seismologists, fire-resistant concrete and clay tile roofs are increasingly popular in California. A two-story stucco house with a tile roof has a lot of mass. Our roof alone weighs nearly 35,000 lb., or the equivalent of about 15 cars parked overhead. Add to that the mass of the stucco, the framing, and tile floors, it's easy to see how critical load-bearing walls could blow out like toothpicks during a strong quake. If you haven't yet experienced the great joy of living on the edge, witnessing a seismic shock wave undulate under your feet and through your house is more than enough entertainment for one day. What keeps anything standing during one those quakes is "shear" amazement. Due to wood's natural resilience, a properly braced wood-framed structure is among the safest places to be during a major quake. To minimize the chance of a structural failure during seismic arrest, it's critical that the anchor bolts for each hold-down meet the minimum imbedment requirement. An HD7A, for example, must be imbedded at least 19" into the foundation stem wall. The bottom of the bolt must have a "J" hook or "L" bend to minimize potential for failure. In concrete with design strengths of 3,000 PSI or greater, use type A307 hex-head anchor bolts instead. Regardless of foundation type, proper drainage is an essential design element. If possible, it is best if the exterior finish grade is a few inches lower than the under-house finish grade. In addition, sloping the grade away from the foundation at a 2% slope is recommended to keep water from penetrating the crawl space. In many existing homes, the site conditions are often just the opposite – an unfortunate byproduct of older urban planning. That is, it is common to find a crawl space whose finish surface is considerably lower than the exterior grade. Often this was done to contain the ultimate height of the structure and to keep foundation costs as low as possible. Unfortunately, groundwater moves to points of least resistance which, in these cases, is underneath the house. This is certainly the case in our neighborhood which is why most of our neighbors have sump pumps that run frequently during the rainy season. In fact, having checked the soil underneath some of my neighbors reveals high humidity and moisture content – which makes a great breeding ground for pests, termites, and fungus, and mildew. With proper design, however, this helps to ensure that any moisture from irrigation systems or surface runoff flow away from the house, rather than towards the house. In addition, heavy irrigation at the foundation is generally not recommended, yet it is a common practice nonetheless. For best drainage management, your civil engineer may recommend two independent drainage systems: one closed system for surface water and rain gutters, and a perforated system called a "French drain" that circumnavigates the foundation – typically at a starting depth of 18" or more below the finished grade. In colder climates, the drain must be below the frost line so water does not freeze inside the pipes, causing expensive premature rupturing. The French drain intercepts groundwater that would otherwise migrate under the foundation footing into the crawlspace, basement, or under the slab. A proper French drainage system is accomplished by trenching around the foundation, lining the trench with a heavy-duty water-permeable filter fabric, and laying 4" perforated PVC or equivalent drain pipe with a minimum 1/8" slope. Contrary to popular belief, the holes should be placed facing the bottom (not the top), as this prevents clogging and ensures best water conduction through the pipe. The trench is then backfilled with ¾" drainage gravel that allows water to easily permeate from the soil towards the drainage ditch. To aid in future maintenance, cleanouts should be installed at key turns in the foundation, particularly where there are right angles that would make it difficult for a snake to navigate. Since the groundwater is generally somewhat filtered by the time it reaches the French drain, the need for cleaning is generally rare. However, over time, it is possible that roots from nearby trees and plants could work their way into the area. Our home has about eight to ten such cleanouts. Ultimately, the French drain will terminate in a sump where the water either drains by gravity flow to the street or a storm drain (slope permitting), or by pump to the street. Since many municipalities do not allow direct pumping to the street (which could spray out well past the gutter), some require an interim catch basin, called a "bubbler" that acts as a small reservoir for the pumped water whose overflow drains by gravity calmly to the street. Should you connect directly to a storm drain, be sure you install a gate flap to prevent water from the storm drain backing up into your foundation. The other drainage system is made of 4" non-perforated PVC pipe. In this case, all downspouts and any surface drains which have been installed as part of a proper landscaping project combine together to carry the flow of rainwater and excess irrigation into the street, storm drain, or again, a sump if the lot does not have sufficient slope. So as to avoid flooding the foundation, these two drainage systems must be kept separate. If for any reason the French drainage system were to tie into the main drainage system via a pump, a check valve is required to prevent backflow of the closed drainage system from backing up into the foundation trench. While the cost of a proper drainage system can add several thousand dollars to your project budget, there’s nothing more important you can do help ensure a safe, comfortable, long lasting foundation and home than ensuring proper drainage around your premises. Unfortunately, this is something that’s generally overlooked or forgotten, leading to very expensive repairs down the road – repairs that are sometimes too costly to implement.